The National Board of Examination (NBE) is going to start the registration for NEET PG 2019 from 02nd November 2018 onwards. The NBE will conduct NEET PG Entrance Exam on 06th January 2019. It is A National Level Test which is held every year by NBE to shortlist candidates for admission in MD, MS, PG Diploma Courses. iv. Armed Forces Medical Services Institutions. v. DNB Broad specialty courses. Candidates who have studied/qualified MBBS from the state of Jammu & Kashmir are not eligible for All India 50% Quota seats. However, the candidates who were nominated by the Govt. of India (under central pool seats) to do MBBS from Medical Colleges in Jammu & Kashmir shall be eligible for All India 50% quota seats. NEET PG 2019 will be a Computer Based Test (CBT). The online question paper will be based on the syllabus as prescribed by the exam conducting authority. Exam pattern of NEET PG 2019 would refer to subjects from which questions are asked, number of questions subject wise, marking scheme, duration of exam, mode of exam. Subjects: Under syllabus given below, you can see subjects from which questions are asked in the exam. 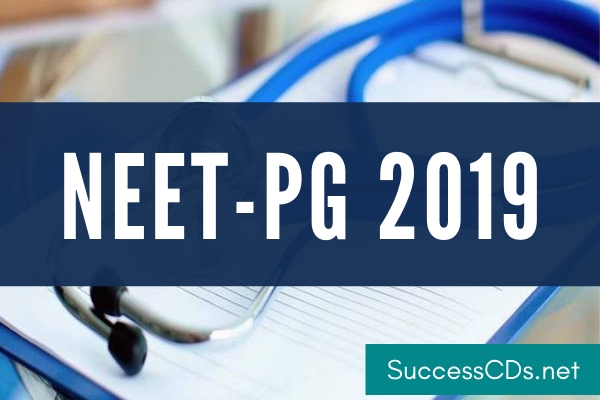 There will be questions from various topics in NEET PG 2019 entrance exam. These topics are primarily divided into following 15 headings.